1peal \pēl\ n. 1: the loud ringing of bells 2: a set of tuned bells 3: a loud sound or succession of sounds. She thought of the word peel, how it meant an unfolding, a stripping away, of layers of paint, of onions, of clothes. And then she thought of the word peal, the eruption of sound, suddenly and forcefully, cascading across the air. Peel, she thought, separation. Peal, she thought, an evermore echo. The force of the “p,” the screech of the “ee” sound, the lullaby provided by the “l.” The words sounded like what they described, both of them. Why she thought of this now was a mystery. She didn’t remember how the word had been summoned up but here it was, wanting to be considered, asking her to make connections and to consider sound. She had a memory of when she was young, nine maybe, and she had participated in a bell choir. She had wanted to play the littlest tinkliest bells, but those were taken so she was sent to the other end, to the large bronze bells, the ones that sounded like gongs, like a heart throbbing. It took all of her energy to shake them back and forth and all her control to do so without smacking herself in the face. It was then that bells shifted in her mind from a light and airy sound to something heavy, something substantial, an honor, perhaps, or a burden. That was a long time and a world away from this small room, where she sat in bed alone, waiting for no one. Soundless, she went through her days, so she played with memory, remembering the way words resonated, like the symphony of “Carol of the Bells,” the strong line of the cello’s bow in Pachelbel’s Canon. She was memories without associations. She held them with nothing to tie them with: balloons without ribbons, kites without strings, a lion cub untethered. So the unfolding was a sort of bliss, each new memory a new world, forgotten and now remembered. But so too was it agony, when she could not place it, when she didn’t understand why she was remembering or who she really was. Appeal, appealing, repeal, pealing, peeling, peal, peel—like clothes, like onions—peeling, pealing, repeal, appeal—things like strawberries, like the nape of a neck, the crease of a hipbone—appellant, appellate, appease—to please, to make oneself invisible—appear—a vision, a sight for sore eyes—appearance, appearing, appetite—to hunger, hungering, for something, a hunger unfounded, insatiable, unmet. She looked down the bed at her toes and saw a twitching. p.s. Yesterday, at a local bookstore, Antigone’s, I purchased a string of bells to hang outside my house. Upon inspection of the tag when I went to hang them at home, I saw these were “camel bells” from India. 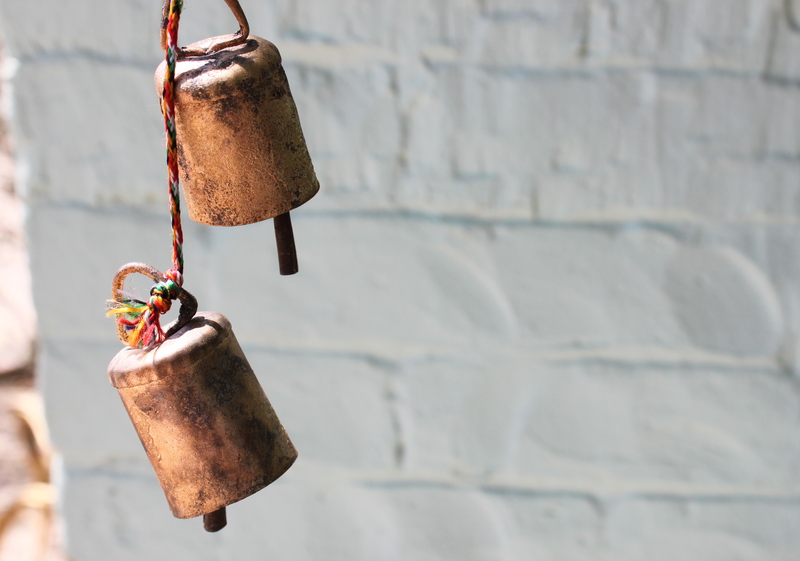 In India, bells are not a frivolity, a surplus, an addition of pleasant sound. They are a necessity. They order life and signal warning, in many different facets. These strings of bells, like the ones I have, are attached to camels, the ships of the desert, to encourage them to move forward in their arduous treks through the hot desert. I trust they will serve as a good reminder, especially on laborious days, to keep rhythm and pace and, perhaps, to lighten up a bit. Several times in my life I have been lucky enough to live within the sound of old church bells — real bells rung by real people, not those hokey amplified recordings played through loudspeakers. All through the night, they marked the hours of my reading and sleeping. Susie and I used to stand outside York Minster and listen to change-ringers work their way through elaborate peals that often lasted for hours. I am talking about majestic bells that were cast by hand six centuries ago, then carried hundreds of feet up into the belfry. Who knows how? Each bell has a personal name and a singular history, but no bell is every rung alone. Over the centuries, they have worked together to ring out weddings and funerals, coronations and the blitz. They are repositories of sorrow and signals of hope. For me, these grand bells are voices of memory and community and aspiration. So when my beautiful goddaughter was injured in a terrible crash 23 months ago, I said that I would offer up a prayer for her every time I heard a bell, no matter how large or small it might be, a tiny tinkling sound or a booming bass. She is still in a coma, unaware of the world around her. Although not inclined to most forms of belief or worship, I still pray whenever I hear a bell. I love this thoughtful response, Steve. Thanks so much for writing and for sharing.